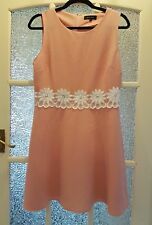 New Warehouse pale pink size 10 smock dress with lace embroidered Detail. Xmas. Brand new unworn Warehouse pale pink dress size 10 with lace embroidered detailing at top of the dress and also pleat detailing. Dress has thin under-layer so it is not see through. Paid £50 as shown on tag and only selling as no longer a 10. Perfect for Christmas party, occasions, nights out and holidays and can also be dressed down with flats (and tights if preferred) for a more casual look. Excellent condition and from a smoke and pet free home. Peach with white embroidered flower. Lovely Ladies Dress. Size Large / Back Zip. See all pictures. Applique embroidered edged neckline. Gorgeous silky stretch jersey dress, individually designed so one of a kind. 2 good size side pockets. 24" pit-pit but lots of stretch if needed. REAL HEAD TURNER! EYELASH LACE CAP SLEEVE. AVAILABLE IN A SIZE UK 12 / EU 40 / US 8 / REGULAR LENGTH. DRESS HAS STRETCH FABRIC. MACHINE WASHABLE. OTHER SIZES & STYLES AVAILABLE. This ZARA WOMAN. Beautiful blush pink shift linen dress. The linen is a soft loose weave fabric, repair needed at the back of the dress to both sides at seam where pictured (the buy it now price reflects the need for repair this was £89 when new). Ladies linen/cotton mix pink dress. Size 14 NWT RRP £36. KAREN MILLEN DRESS ~ DU039. Stunning Karen Millen Silk / Satin Halter Dress. Halter Neck with Ribbon Detail. 95% Silk, 5% Elastane. Diagonal Pleat Detail at the Bottom Left Hand Side of Dress. ~ UK SIZE 14 ~. Size: UK 10 / US 6 / EU 38. Length: 38" / 96.5 cm. Embroidered waistline. Phase Eight. Phase Eight Navy Blue with a pretty Pink Hem. V Neck Dress. lease let us know ! 13" Concealed left hand Side Zip. BODEN pink/cerise maxi dress.Size 12R.Embroidered detail.Orange,purple. Précis Petite size 18 100% Linen fabric Side zip fasten Dress is lined In excellent hardly used condition Measures underarm to underarm 21.5" Measures underarm to hem 39" Measures shoulder strap to hem 45"
Size 12 - boohoo skater dress, with lace detail at the back. Delicate colour, delicate fabric Is slip on Beads at the shoulders Some of the beads on the body of the dress have come off they are individually sewn on Pretty embroidery Is lined See photos for description Any questions please feel free to contact me Underarm to underarm measures 20" Underarm to hem measures 30"
TALL floral embroidered slip midi dress. 100% Polyester. Machine wash. Model's height is 5'9” and she wears a UK size 8. BNWT Mark's & Spencer's Size 16 Chiffon blush pink occasion wear Dress. Condition is New with tags. RP £59.00 Dispatched with Royal Mail 1st Class. Yet another stunning dress thatclam selling for my Sister...its in the very on trend Coral/orange colour in Ombre design..the fabric is 100%cotton with embroidery anglais floral pattern ..it us fully lined and has a side seam zipper.. Will be great for many occasions and teamed up with a vest array of different coloured accessories and footwear..or for work with a little jacket or cardigan in the warmer months. Cost £49.50 Next day postage after payment. Please feel free to contact me for more details if needed. Thankyou for looking. Beautiful *Derhy* Pink Kaftan Small Dress Cover Up Beach Tunic Embellished. Dispatched with Royal Mail 2nd class free postage .